Early Banksy mural accidentally painted over as shop gets new owners. A piece of art which is believed to be one of Banksy’s earliest murals has been accidentally painted over. 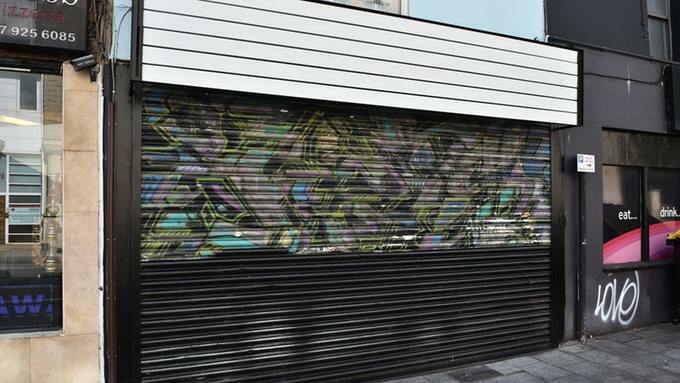 The graffiti artwork had been on the shutters of a small shop in Bristol’s Park Row since the 1990s, before its new tenants unwittingly ordered it to be removed. It was only when a Banksy superfan, Simon Whiteaway, walked past the graffiti being painted over that the significance of the mural was realised. “I had to explain to him what it was and he was shocked. “The shop was a skate shop for a long time – Rollermania – and Banksy knew its owner, Tony Coffey. The origins of the mural were confirmed by London-based artist Inkie, who began spray painting with artists including Banksy and Massive Attack founder 3D in Bristol during the 1980s. He said: “It was first painted by 3D Massive Attack in the mid-eighties, then me and FLX painted it followed by Dicy And Feek TCF crew. “Banksy then painted a rather ugly freestyle over this in his pre-stencils period.